Francis Crick, who helped discover the double helix shape of DNA along with James Watson, has died aged 88. Professor Crick died at Thornton Hospital in San Diego, US, where he had been battling colon cancer. The British-born scientist won the Nobel Prize for his work on DNA's structure, which he helped model in 1953 at the University of Cambridge. "I will always remember Francis for his extraordinarily focused intelligence," Professor Watson said on Thursday. "He treated me as though I were a member of his family. Being with him for two years in a small room in Cambridge was truly a privilege," he continued. "I always looked forward to being with him and speaking to him, up until the moment of his death. He will be sorely missed." Professor Crick was made a Fellow of the Royal Society in 1959, three years before he was awarded a Nobel prize. Primarily this was for his work on DNA, but also for his study of the structure of proteins and viruses. 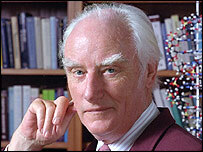 Commenting on his death, Lord May of Oxford, the President of the Royal Society, said: "We are all greatly saddened to learn of the death today of Francis Crick, who was known worldwide for his contribution to discovering the structure of DNA, which earned him a share of a Nobel prize in 1962." Research undertaken by Maurice Wilkins and Rosalind Franklin paved the way for Francis Crick and James Watson's famous discovery. Wilkins and Franklin took the first X-ray images of DNA in 1950, which caught the attention of Crick and Watson - inspiring them to investigate further. Professor's Crick's death comes one year after the 50th anniversary of the discovery of the structure of DNA. "Just last year we were celebrating the 50th anniversary of the publication in the journal 'Nature' of his landmark scientific paper, written with James Watson, which described the correct double helix structure of DNA for the first time," said Lord May. It is now one of the most famous scientific papers of all time, but began with an unassuming pair of sentences: "We wish to suggest a structure for the salt of deoxyribose nucleic acid (DNA). This structure has novel features which are of considerable biological interest." Lord May continued: "Francis Crick made an enormous contribution to science and his discoveries helped to usher in a golden age of molecular biology. "His death is a sad loss to science and our thoughts are with his family and colleagues." Professor Crick was born in Northampton in the UK but had been living in La Jolla, California, US. He was a distinguished research professor and former president of the Salk Institute in San Diego. "Francis Crick will be remembered as one of the most brilliant and influential scientists of all time," said Richard Murphy, the Salk Institute's president and chief executive officer. Dr Matt Ridley, author of Genome and Nature Via Nurture said: "Francis Crick made not one but many great scientific discoveries. "He found that genes are digital codes written on DNA molecules, he found that the code is written in three-letter words and he was instrumental in cracking the code. "Any one of those things would have got him into the scientific pantheon. Discovering all three places him alongside Newton, Darwin and Einstein." Since I read the book "The Double Helix" I was fascinated by the extraordinary genius shown by Professors Watson and Crick. The death of Francis Crick has robbed us of one of the most wonderful geniuses of our age. I hope he will serve as an example to a new generation of scientists who will serve their cause with the passion and dedication Professor Crick served his. We are going to miss a greatest genius of our time. It's hard to over-estimate the importance of Francis Crick to modern biology. It's not just that he discovered the mechanics of various biochemical processes: his "central dogma" of information flow in living systems showed us what his, and others', discoveries meant, and pointed the way for the whole of molecular biology. He unlocked and explained the fundamental mechanism underlying genetics and evolution. He should, indeed, be remembered as a scientist of the very first rank. He will be remembered as a top scientist and a genius. He lived a quiet life away from the spotlight and the media as a scientist of his calibre should do. He will always be an inspiration for all of us, the young scientists around the world. A PhD Student from UCL. He will be remembered for ever for his work. 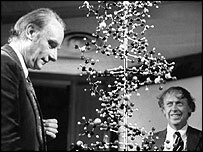 I read Biochemistry at University and the black/white picture of Watson and Crick for me captures men who were at work not realising the impact their studies would have on the scientific world. May his soul rest in peace. There is absolutely no doubt in any one who understands molecular biology that Crick along with Watson made a discovery that changed the understanding of life dramatically and he will always be remembered for his achievements. Thank you Francis Crick and James Watson for enriching our knowledge of life. Your work has been inspirational. In the long history of human endeavour to understand nature a few outstanding personalities have made vital contributions. Professors Crick and Watson are among those exceptional people to whom humanity owes a great debt. Professor Crick will always remain an inspiration, along with Professor Watson. The spark of life (DNA)was ignited long back, but Francis Crick enlightened us how it was - the World will never forget his contribution for the betterment of healthy life on the planet. I met him once; he came across as very fierce when confronted with hangers on but a kindly gentleman to those who genuinely wanted to learn. Let's hope there are many more like him. He will be remembered as a genius who discovered the basic simplicity underlying the enormous complexity of Life. May he rest in peace. Besides his work on DNA, Francis Crick has also done some important work on human consciousness. I wish he would have lived longer to give the world a valid theory delineating the scientific and philosophical problems of the human brain. He visited us at Cornell at Rosenblatt's Cognitive Systems Research Program in the mid-sixties. His son was designing robots at the time. It was a rare privilege to meet Crick; we'll all miss him. T. Koken, Costa Mesa, CA, U. S. A.
I am just another Molecular Biology graduate who has and will always attribute anything I achieve in the field of science, to Professors Watson and Crick. Professor Crick will never be forgotten, he will always be an inspiration to me along with Professor Watson. Thank you so much for having discovered the wonderful field of Molecular Biology. We hail the discovery of DNA as one of the greatest, if not the greatest, finding in the history of mankind. It led the way to understanding the basic tenets of life. May he attain eternal peace! The discovery of the DNA double helix has truly shaped our lives. It was one of the greatest discoveries of modern day man. It allows us to look back to past civilizations, man and beast, ....what a wonderful time we live in. Thanks professor Crick! When I was a student of biochemistry in the university, I was greatly thrilled by the work that was done by Watson and Crick. The discovery of DNA was one of the greatest things to have happened to science and mankind. I will miss this great mind. "The legacy of his work touches all our lives"